My goal in ministry is simple, I want to be your Pastor. I want to lead you through the word of God, while I follow you through the circumstances of life. I want to teach you, I want to learn from you, I want to love and support you and your family. Lionel Means is the Pastor of Uplift Christian Ministries. 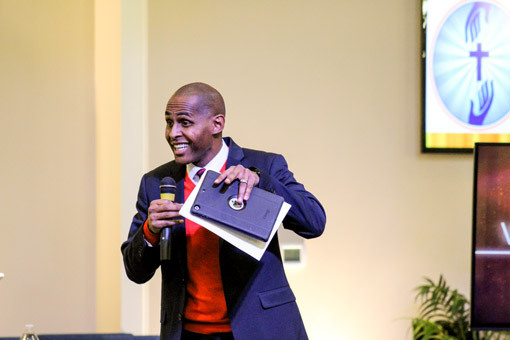 A native of Birmingham, AL , Lionel moved to Charlotte in 2006 under the direction of God to start a ministry in the community God was sending him. Pastor Lionel was raised in the baptist church. He served under the direction of Pastor E.O. Jackson at the Greater New Antioch Baptist Church in Birmingham, AL. Prior to planting Uplift, Pastor Lionel served in the Christian Methodist Episcopal (C.M.E.) church for 7 years in both lay and ministerial capacities. This ministry’s birth is a result of the help and support of his wife & children, the families from his community & work, and the help of Grace Crossing Baptist Fellowship Church, under the direction of Pastor Jason Blanton. Lionel is married to his high school sweetheart, the former Ashaki Sloan, also a native of Birmingham, Al. They have two children, a son ,Lionel “Angelo”, III and a daughter, Sloan Amari. The entire family is humbled and excited about the opportunity God has given them to serve and worship in their community and beyond.